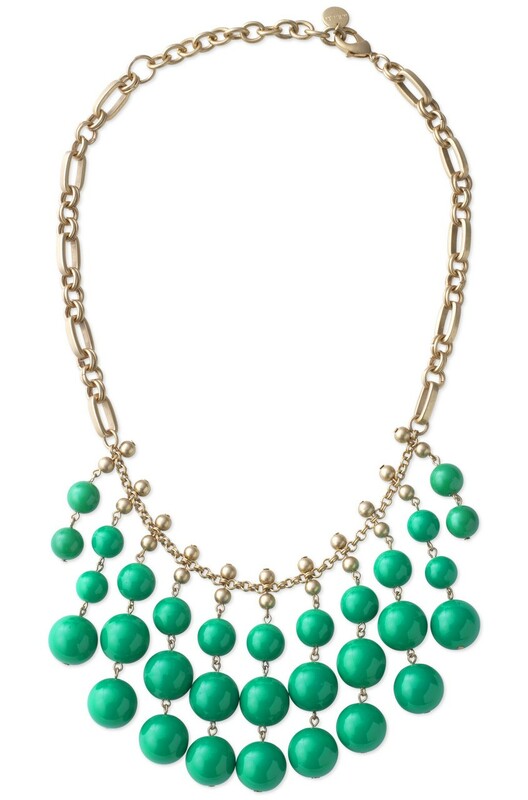 Stella & Dot’s Spring 2013 Collection is here, and it’s my favorite yet! I feel like I say that every time, but it’s always true. Our design team continues to blow me away with each new collection. It’s so exciting to work for a company that is always on trend and ahead of the game. Want to view the entire line in our new look book? Click here! This season’s Wanderlust collection was inspired by a modern take on the southwest and luxe boho. The palette includes lots of mixed metals, desert pinks, oranges, and soft red. One of the things I love most about these pieces is that they are mostly handmade — hand strung, hand-hammered, hand-threaded, and it takes hours and hours for a single piece to be completed. 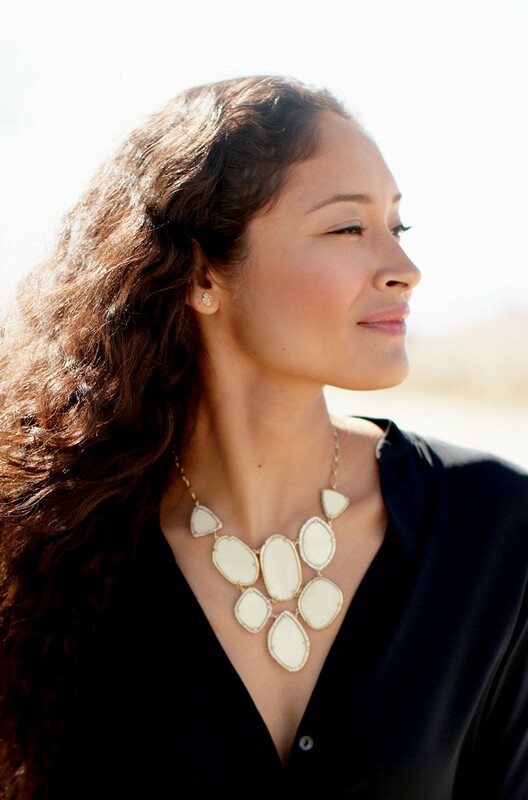 One of my top favorite new statement necklaces for 2013 is the Fiona Bib Necklace. The ivory color with gold trim is so very versatile — I can’t wait to pair it with several prints already in my closet. And I really like the little bits of sparkle here and there for added glam, without making it too dressy for daytime wear. 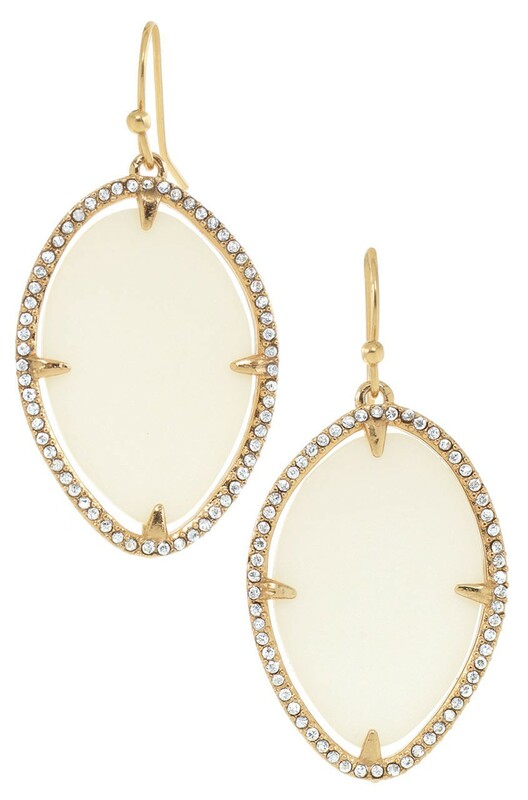 The Fiona Earrings are a great way to get the look of the Bib Necklace for less. These will be a wardrobe staple year-round! How amazing is this mixed metal necklace? Not only is it easy to pair with so many pieces you may already have due to the various metals used, but it can also be worn long or doubled! The coolest part? The Mesa is made up of 4,000+ beads! The classic Garden Party collection is inspired by a vintage signature S&D style and celebrates our bold and joyful heritage. 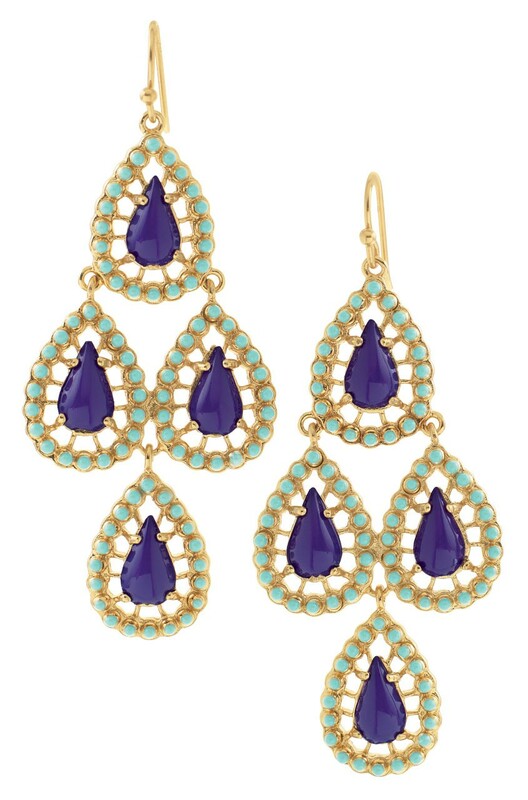 I love the color and whimsy of these pieces — they’re very Palm Beach. They make me wish I had a big pool and backyard with a garden so I could throw a cocktail party and wear these beauties! French for ‘pretty’, the Jolie necklace is a joyful style with easy to wear appeal. In one of the key colors of the season, kelly green, this necklace pairs beautifully with both solids and prints and is a great transitional piece going into the warmer months. It can be worn short or longer. At only $79, it’s a steal for a big, bold necklace. I have been so excited about these colorful enamel bangles since I saw a sneak peek weeks ago… and I could not believe they’re only $19 each! Stack them for a fun, layered look or wear them with other gold bangles. The Kimberly Necklace is so different from anything I’ve seen in our line before. The lattice structure of this 60s-inspired piece is so interesting, and it’s nice to have a statement necklace that elongates the frame rather than just focusing on the neckline. Love the matching earrings, too! 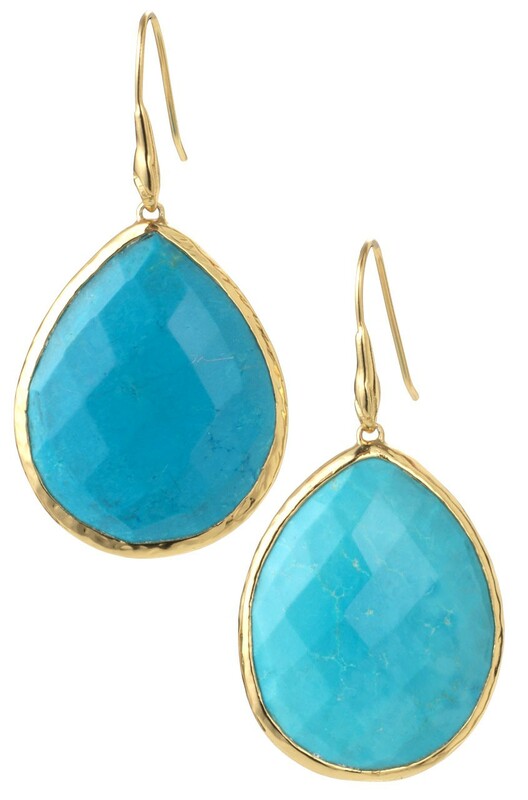 These Seychelles Earrings come in the gorgeous, deep blue/turquoise combo as well as pink. The teardrop chandeliers feature beading and hand-painted enamel — perfect for any spring soiree! The Super Natural Stones collection showcases the essence and natural beauty of semi-precious stones. Pieces come in three versatile palettes (blues, pinks, and naturals), and they offer a nice range of understated designs. Turquoise is here in an abundance this spring, and I couldn’t be happier! How fab is this Mary Margaret Ring? 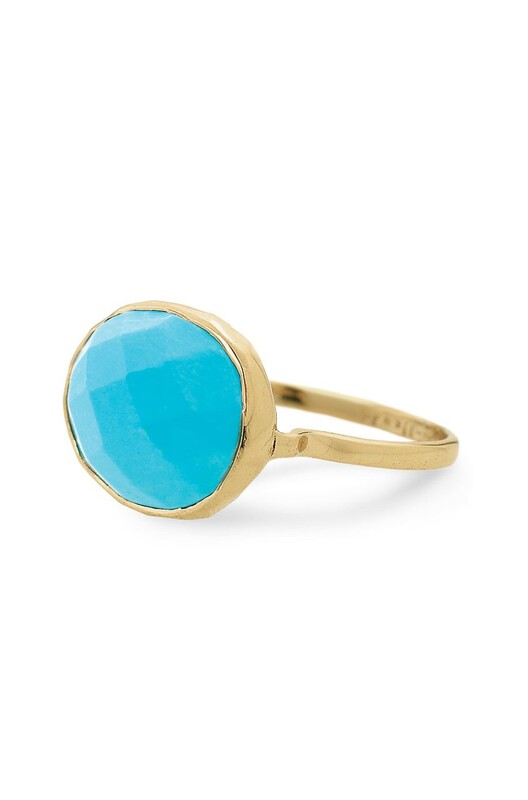 It’s entirely hand-crafted in India from a single, hand cut turquoise magnesite stone. Comes in sizes 5-9. These turquoise earrings are the newest addition to the hugely popular Serenity Stone Drop Earrings — we debuted them in jade last year, and they were a top seller of mine. These dyed jade stones are also hand-cut and sure to be a big hit! The Sanibel Chandeliers are lightweight and elegant — I like that the light color palette makes them feel really airy, even though they’re made with stones. 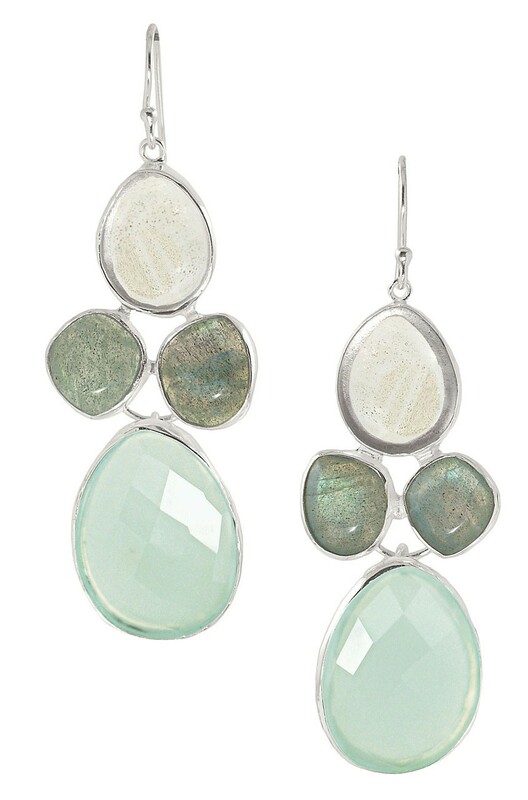 They feature a unique selection of genuine stones (semi-precious labradorite, aqua chalcedony and rutillated glass) in an organic cluster that will shimmer day or night. 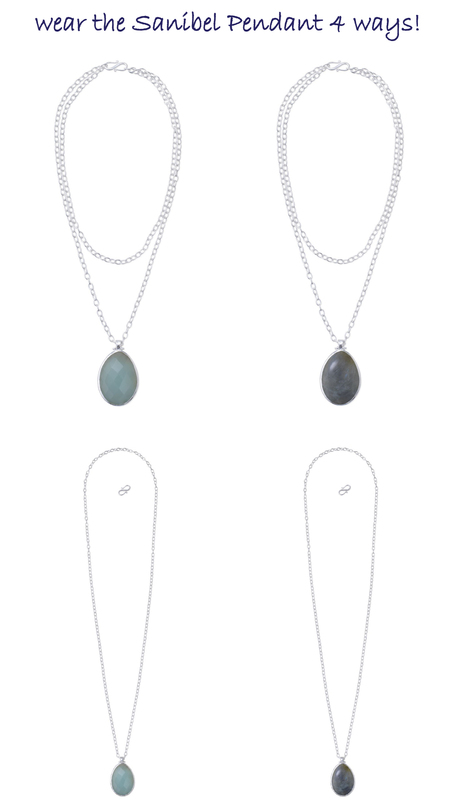 The Sanibel Pendant is probably our most versatile piece in the new line! It’s a reversible pendant that can also be worn long or short with an S-hook. One side is semi-precious labradorite (a little dark and moody) and the other side is aqua faceted glass (light and airy like the earrings above). The Foundation Bracelet is a unique, brightly-colored bracelet that comes in raspberry and lime. These bracelets are a great addition to any arm party. It’s the perfect way to support a wonderful cause while looking stylish! 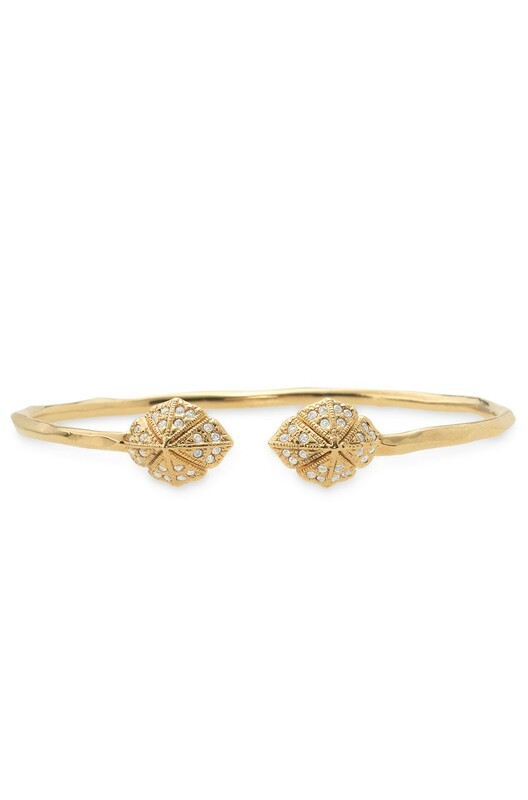 Last, but definitely not least, is the Eden Bangle. I love the hand-hammered look on the bangle, and the pave pyramid tips add a tailored, casual vibe to your look. It’s super cute paired with the Gilded Arrow Bangle, Eden Studs, and Valor Pendant Necklace.